"You never seen the likes of me, baby!" This is it! This is not a drill, everyone! The sub-unit we’ve all been waiting for is here! The three ladies who represented Jellyfish Entertainment in Produce 101 are finally debuting as a trio! Part of a larger group, Gugudan, Sejeong, Mina, and Nayoung, are now debuting as the group’s second sub-unit, gugudan SEMINA. Known for their iconic performance during Produce 101, will they be creating a debut as impactful as “Something New”? Recommended for: Danjjaks (Gugudan fans), those who wanted them to release something like “Something New”, fans of retro sounds, and people who wants their ears to get cleansed. Not recommended for: Blasphemous people who are the opposite of the above. This may not be Act 2: Narcissus but Gugudan is narcissistic enough to name the album and song with the name of their sub-unit. The title track for gugudan SEMINA’s first single album “SEMINA” is titled “SEMINA“. However, the name of the song is worded quite differently in Korean and its correct translation would be “jealous” instead. Produce 101 viewers may have already been familiar with the genre they went for since “SEMINA” is an upgrade of what they did during the show. Many had been disappointed that Gugudan went for an entirely different style , but of course, sub-units are meant to show a different color than the group itself so now we have the sub-unit we’ve all been waiting for. “SEMINA” is the old-school brassy retro-like song we can all not help but love. The song starts with Sejeong‘s sassy and powerful entrance with the dynamic followed by Nayoung‘s husky yet bold vocals. The excitement starts to pile up as Nicki Minaj spits fire we typically don’t hear in a Gugudan song. The tension builds until it gets released by a strong and impactful chorus that is a combination of the three girls’ wondrous voices. Fast forward to the sweet and sultry bridge up until the extraordinarily amazing harmonic runs by the end of the song, “SEMINA” is totally giving the listener nothing but a certified eargasm. Yes. “SEMINA” is that good. 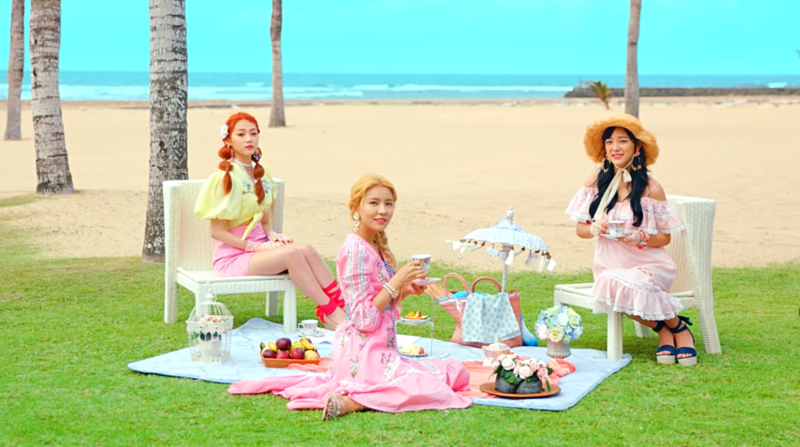 The song may remind you of the style of MAMAMOO and perhaps SNSD-TTS too, probably because the concept they’re going for is quite similar: to bring an upgraded performance. Right when people are already forgetting Nayoung is a member of Gugudan because of her constantly decreasing number of lines and exposure, she appeared in “SEMINA” and her vocal performance straight up set the roof on fire! Really, it’s like we’re back in Produce 101 where Nayoung confidently sang as a contender for main vocal. Personally, I think she stands out the most in the sub-unit, we can definitely see how a Kim Nayoung truly shines. Well, I can say the same for Mina and Sejeong too because all three shine in different colors. Sejeong’s singing is truly one of a kind, as usual, and Mina’s rapping is getting better and better by the day. “SEMINA” is nothing but a solid, amazing, and breathtaking debut song that truly captured the extent of SEMINA’s talents. Watching “Ruby Heart” performances on YouTube, I frequently see comments claiming that the song is a better fit for title track than “SEMINA”. I won’t agree on the ‘better fit’ part but I have nothing but praise for the song either way. “Ruby Heart” is about the same as the title song in terms of wow factor, vocal skills, production, and quality. It differs in a way that I feel as if this song is more flirty and funky than the other one. “Ruby Heart” is an R&B-pop song that has retro elements splashed all over. As expected, Nayoung and Sejeong’s vocals are still as powerful, but Mina’s rap this time is quite a letdown. In “SEMINA”, the rap of Mina is past the line named “aegyo voice rap” (if that exists) but in here, it has little to no distance. Mina’s voice while rapping is really great so I hope they stop making her sound ‘cuter’ than she is. Anyways, “Ruby Heart” is another solid, amazing, and breathtaking track that truly compliments the title track in this album.